Lioness with cubs spotted by a remote research camera. Photo: Ruaha Carnivore Project. Lions are one of Africa’s flagship species, but their numbers have halved in the last 20 years, with around 20,000 remaining. This means there are now fewer wild lions left in Africa than rhinos. Lions have disappeared from over 90% of their original range, and now only six large populations remain. One of those is in Tanzania’s Ruaha landscape, which is estimated to hold around a tenth of the world’s remaining lions. Many lion killings in the Ruaha landscape occur for cultural reasons, where young men hunt lions in order to receive accolades, gifts and female attention from within their communities. To reduce these killings, we have been working with the Lion Guardians organization in Kenya, and adapting their model for the Ruaha landscape. The Lion Guardians approach is to select and train the most influential local warriors, and employ them to liaise with their communities and stop lion hunts from occurring. Conflict Officers with the Ruaha Carnivore Project. Photo: Ruaha Carnivore Project. They also help householders reinforce their bomas using traditional methods, help find lost livestock (thereby helping villagers and reducing the chances of carnivore attacks and killings), monitor the presence of lions and other wildlife, and chase lions away from households if people feel in danger. This job provides them with status and wealth without killing lions—and we now also host traditional dancing events so that men can dance with young women without needing a lion hunt to do so. An improved boma. Photo by Jon Erickson/Ruaha Carnivore Project. This has been very successful around Ruaha—by the end of 2015 we had 14 warriors working across seven village zones. They had prevented or actively stopped 28 lion hunts, and had fortified over 330 bomas using densely packed thornbush. 5,492 livestock were reported as lost to the Guardians, and they managed to find and safely return 5,279 (96%) of them. The value of this recovered stock to local households was over US $750,000—a hugely significant amount in these poor pastoralist societies. In addition, the Guardians regularly monitored village land for lion presence, and saw tracks of lions on 992 occasions, as well as directly seeing lions 133 times. The Ruaha Lion Guardians team underwent a rigorous certification procedure during 2015, and we are proud to say they passed, so are now ready to become independent from the main Lion Guardians organization. This will allow the model to become even more well-suited to the specifics of the Ruaha situation, so we are excited about developing this program further throughout 2016. All this work is having significant success around Ruaha. We are seeing reduced livestock attacks, increased community benefits, and reduced carnivore killings. However, effective conservation requires action at a huge scale, so we are proud to have co-founded the Pride Lion Conservation Alliance this year, where we are partnering with Ewaso Lions, Lion Guardians and Niassa Lion Project and working together to conserve carnivores across much of East Africa. 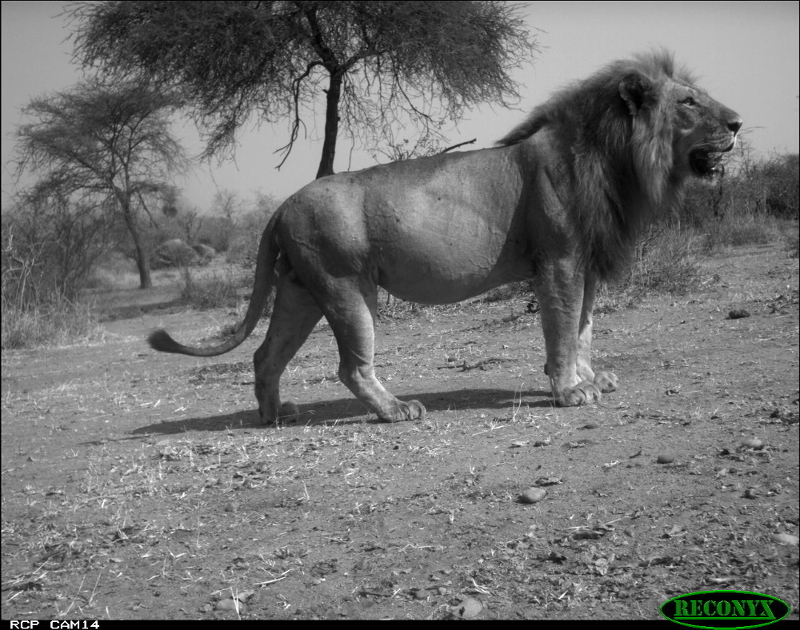 A large, male lion is photographed by a remote research camera. Photo: Ruaha Carnivore Project. The work that Dr. Amy Dickman is doing to protect large carnivores has resulted in the Ruaha Carnivore Project becoming a Woodland Park Zoo Partner for Wildlife project this year. Partners for Wildlife projects take a comprehensive approach to conservation by incorporating habitat and species conservation, research, education, capacity building and local community support. Every visit to Woodland Park Zoo supports this kind of work; every visit to Woodland Park Zoo helps save wildlife.